We delivered .NET cutting edge technologies services and restructuring enterprise IT process across connection applications and services code bases on premises or in the cloud. Microsoft .NET projects have delivered a number of .NET projects globally due to our skilled .NET workforce using cutting edge technologies. Enterprise restructuring methodologies integrate IT process across the organization's departments. Many businesses operate on many factors, and one of the biggest services is a fragmented ecosystem. 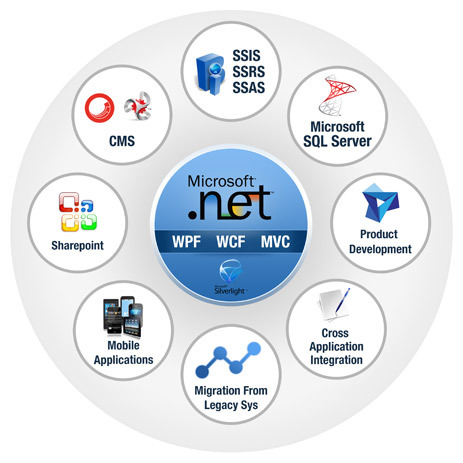 CRM, ERP, social media, or proprietary software can be linked together with our third party application integration services that use the WCF framework. We provide you with database integration, reducing the need to switch entire databases which would be expensive. We integrate crucial business applications consistently with variety of platforms using leading processes, tools and technologies. Applications hosted in a house- in addition to an external system can communicate together, allowing business to quickly meet their unique business needs through specialized solutions. Sharing of Data - Integration ensures consistency of data across teams and departments, simplifies processes, and entitle employees with a comprehensive, accurate view of customer information. Web services - With the Microsoft .NET technologies any types of system can be combined with business and financial system regardless of platform or programming language.